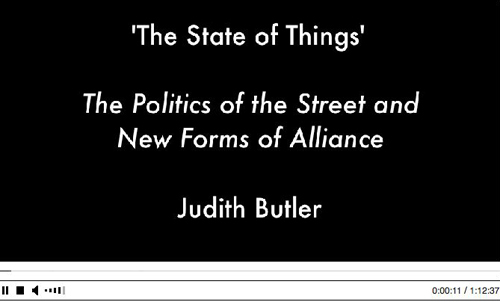 (click on image to watch video) Although some have argued that the politics of the street has been replaced by new media politics, it seems that the public sphere within which politics takes place is now defined by a specific mode of bodies interacting with media. Hannah Arendt once argued that there could be no exercise of freedom without the creation of a ‘space of appearance’ and even ‘a right to appear’. How do we understand those new forms of democratic insurgency that form alliances that are not in coalitional forms? Who is the embodied ‘we’ on the street transported through media, and yet in place and at risk?